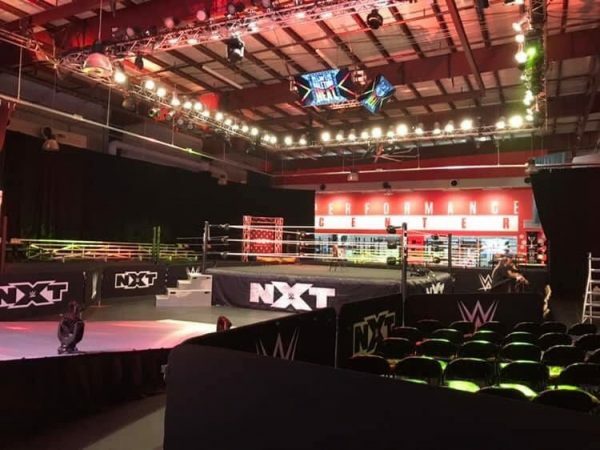 Below is a first-look photo of WWE’s Halftime Heat Performance Center setup. As previously reported, WWE will be holding a tag team match featuring NXT talent’s during the NLFf’s halftime show. That match will be a Six-Man Tag Team Match pitting Aleister Black, Ricochet & Velveteen Dream against NXT Champion Tommaso Ciampa, newly crowned NXT North American Champion Johnny Gargano & Adam Cole.